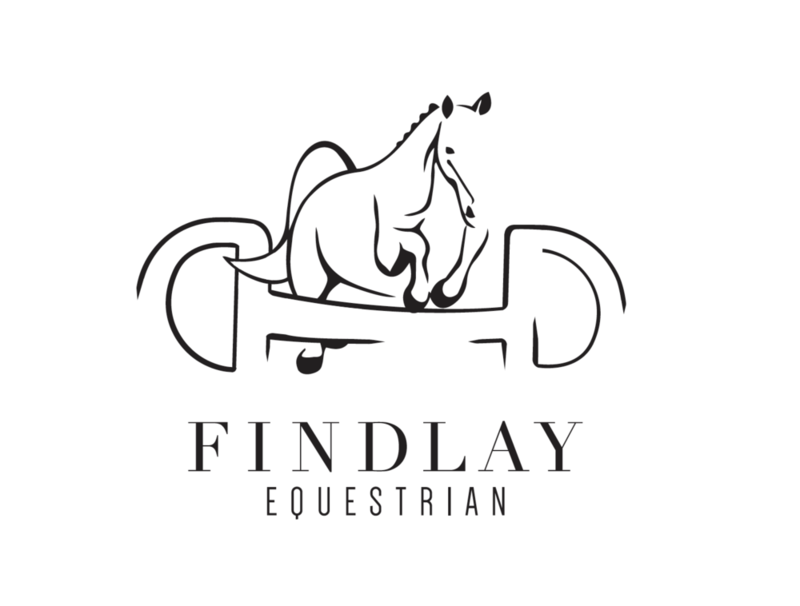 Some logos and new brands can take a few days to create, but this special one… the Findlay Creative Brand took a matter of months. The progress from Concept to Final design was a matter of 9 Revisions and many small refinements. and in my opinion, worth it! When the client approached me, they envisioned a horse jumping proudly over a jump, but the jump to be a bit (the part that goes in the horse’s mouth when you are riding). This is the image the clients provided. Next step was to create a horse what looked like it was leaping over a bit. After lots of research and sketches, I created this horse that was chosen as the final horse to be used. This sketch set the tone of the design to be minimal and line based, with minimal detail and strong line. The next challenge was to combine the imagery and ensure the illustration style matched. Even though the clients initially requested the detail bit, it was decided that the logo would “read” better with a simpler version of a bit. This new version was it! Loving the new avenue we were taking, it was time to refine the details and colours. With some refinement of the height of the horse, and the negative space around the bit, the final logo was born. Want 25% off your webpage?